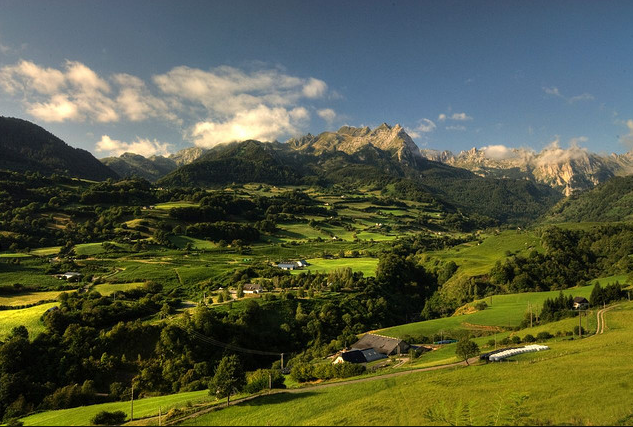 Gabietou hails from the steep pastures of the Western Pyrenees. 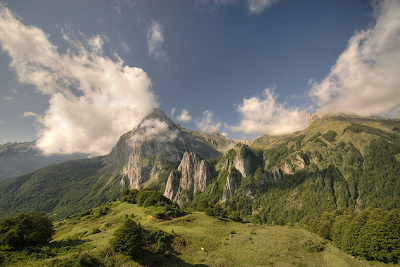 During the summer cows and sheep alike graze on alpine grasses, wild herbs, and flowers high in the mountains. The french have a term for seasonal cheese production: devette. Devette comes from the verb devetir, meaning "to undress." It's used to describe the practice of moving a herd of ruminants up into high, mountain pastures to graze on the lush and varied grasses that become exposed as the winter snow melts away. Every spring the herds are unleashed to "undress" the mountain. The practice evolved in valley settlements that are surrounded by mountain ranges. Farmers had to be astute planners to feed their herds year-round. So in the spring, when grasses on the mountainsides emerged from the snow, farmers would lead their herds up to take advantage of the new growth -- and thereby reserve more of their easy-to-harvest valley pastures for hay production, which could keep the cows fed through the winter. All that fresh, verdant grass results in rich, flavorful milk and, in the right hands, cheese. Gabietou (gah-bee-ay-too) is a prime example. Made in one of the valleys running through the French Pyrenees, a region known for its shepherding and cheesemaking traditions, it made its debut in 2001. The cheesemaker, Gabriel Bachelet, was obsessed with finding the perfect blend of spring milks for his cheese. After much experimentation, he settled on a combination of one-third sheep and two-thirds cow's milk. 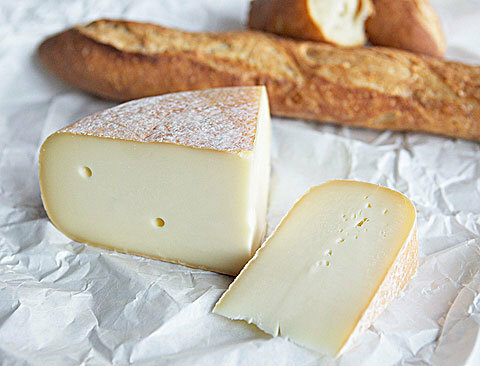 The combination gives the semifirm cheese a luscious texture (think fontina, but more luxurious) and a wonderful bouquet of aromas and flavors, including hints of hazelnut from the sheep's milk. Wheels of Gabietou are made in late spring, and at one week old they are moved to the aging caves of famed affineurs (experts in cheese aging) such as Herve Mons. There, they are washed weekly to keep their rinds supple and encourage the activities of beneficial bacteria called Brevibacterium linens, aka B. linens. These bacteria give Gabietou's rind its lovely light peach hue. The affineur tends to the wheels for three to five months, releasing the first wheels just in time for harvest in September. Silky, nutty and altogether bewitching, Gabietou will allow you to bring a hint of vibrant spring pastures to your fall table. The texture of Gabietou is semisoft, smooth and supple with occasional holes, or "eyes." The rind is a thin orange, copper color, slightly pungent but not overwhelming. Flavors are dense, rich, mellow and creamy with notes of fruit that are balanced by earthy, mushroomy notes.